Hey everyone, it’s Finance Fridays again. Nowadays, all you hear everywhere you go is “bitcoin” and “crypto” this and that. I guess Cryptocurrency is somewhat mainstream now. Like I said in my prior post “No Bitcoin for Hawaii“, you can’t technically buy Bitcoin in Hawaii. However, today, I’m going to try to explain “How to Buy Bitcoin in Hawaii”. “Currently, there is still no great (safe) way to buy Bitcoin in Hawaii. When I tried to sign up for Coinbase a few months ago, they asked for my home address at that point and denied me even creating an account. Everyone seems to want to get into Bitcoin nowadays. Their userbase has increased to 13 million from only 5 million a year ago. Their app shot up to #1 on the app charts for a brief period as well. I have heard of people using a family member’s mainland address or choosing a “fake address” like American Samoa or “Outlying Islands” or some other US Territory. The current regulation on cryptocurrency is very vague overall. It is unclear whether you could get into any legal trouble over this later on. Personally, because of the portability of cryptocurrency, I think it is unlikely. You can just buy Bitcoin and move it to an exchange (like Bittrex, for example) or move it to a wallet, and it is no longer associated with Coinbase at that point. There are smaller sellers who either don’t know or don’t care about the legislation in place which affects Hawaii. However, these sites tend to be less trustworthy with higher transaction fees. This may have changed, but back when I was looking, the sites which people were able to buy Bitcoin from with a Hawaii address were usually from foreign sites, such as xcoins.com, LocalBitcoins.com, and Uphold.com. However, I don’t have any experience using these sites and to be honest I worry about their security. If you have a family member on the mainland, they can potentially buy it for you. They could then just transfer it directly to your wallet. However, moving money between two family members may raise some eyebrows come tax time. Technically, you can “gift” a family member up to $14000 a year without paying taxes on it, so anything less than that shouldn’t be a problem. However, I’m not a CPA so, it’s probably a good idea for you to ask a tax person. However, because this was a post about “How To Buy Bitcoin in Hawaii”, I thought it was best to include it. There are Bitcoin ATMs in pretty much every state. However, only two exist in Hawaii, and both are in Honolulu. Unfortunately, the transaction fee is very high at 15%. The individual transaction limits are $900 and $1000. In comparison, Los Angeles, CA has 146 Bitcoin ATMs and their transaction fees range from 6% to 15%, with the norm being around 8%. If the state legislation making it very difficult for Hawaii to buy Bitcoin ever goes away, I would imagine that we will get more Bitcoin ATMs and our transaction fees will go down to around 10%. Ughhh… what should I do? There is no good answer for this. None of the above options are great. Just remember that cryptocurrency is basically just gambling. Any transaction fee you pay whether it’s 1% or 15% is basically money lost that you have to make up for with gains. Even though I was horribly wrong about Bitcoin hanging around $7000-$10000 for the rest of December 2017, I still believe that Bitcoin is horribly overvalued, and we are smack dab in the mania phase of a bubble, right around early enthusiasm. Of course, I may be horribly wrong. No one can predict the future. Don’t get me wrong, I do believe Bitcoin has value. However, I think its meteoric rise to nearly $20k before settling around $16k, yo-yo-ing back and forth between $14k and $18, even dipping to $12k is just craziness. I think a lot of this has to do with people “getting out” who bought Bitcoin at like $1000 or even $100, combined with the Fear of Missing Out (FOMO) from investors. Can you imagine if these 1000 people just decided on the same day “let’s sell”… what kind of crash would happen? There would be a mad rush to try to get out. The majority of other 60% would try to get out as well, leaving many, many people holding on to something that was nearly worthless. At that point, even if Bitcoin did recover, it would be nearly impossible to get back up to its current level… I think. To me, the risk isn’t worth it, but like I said, this is just gambling. If you’re going to buy Bitcoin, then just consider it like going to Las Vegas, only play with what you can afford to lose. Ethereum went from $387 to $686, which is great. Waves went from $5.80 to $13.75, which is excellent. BAT went from $0.30 to $0.23, which is… a loss. However, BAT was always the long shot, which is why it only got 20%. This would be a HODL portfolio, meaning buy and hold. It’s a meme from December 2013. If you want to do $1000, then you can just knock a zero off. Even though it appears the whole world disagrees with me, I think Bitcoin is overvalued currently, and am truly worried about including it in a HODL portfolio, unless you can safely commit to holding on to it for the next 30+ years. If you can commit to that, then you can take $1000 out of Ethereum and Litecoin and buy $2000 worth of Bitcoin instead for a 2000/2000/2000 spread of Bitcoin/Ethereum/Litecoin. Don’t get me wrong, I think Bitcoin will continue to rise, if we believe the bubble graph. I think we’ll see it hit even $30,000 or $50,000 at the “new paradigm”. My concern is that I don’t know when or how far it will fall… and neither does anyone else. Remember I am not a crypto wizard nor am I professional in terms of finance, taxes, or what have you. This is the information I was able to come up with based on my own research and my own speculation. 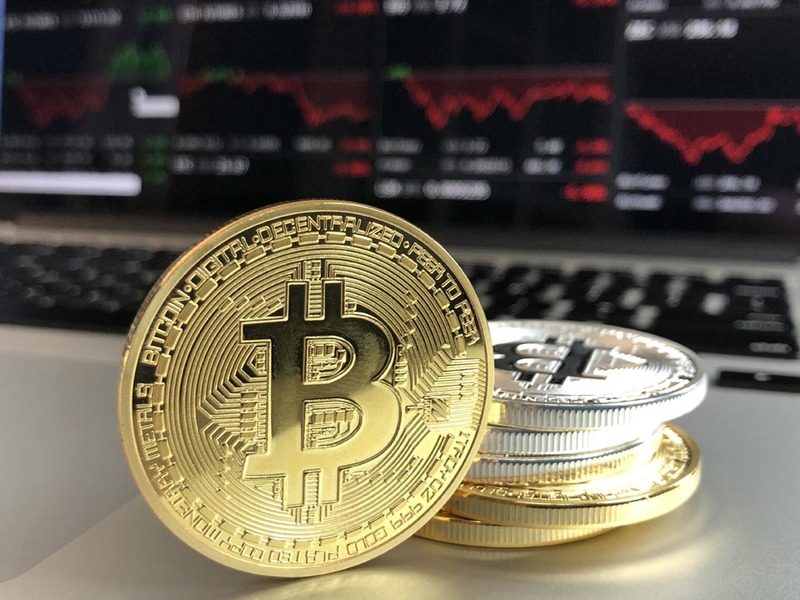 Cryptocurrency is very volatile and is essentially high stakes gambling. I advise people to be very careful and only bet what you can afford to lose. For full transparency, a friend of mine did buy some crypto recently on my recommendation. He currently has 4348 Ripple (XRP), 3553 Cardano (ADA), and 3045 Stellar Lumens (XLM). Since buying them, they’ve all done pretty well recently. However, who knows what will happen? Despite being wrong so far, I still think Bitcoin is overvalued. 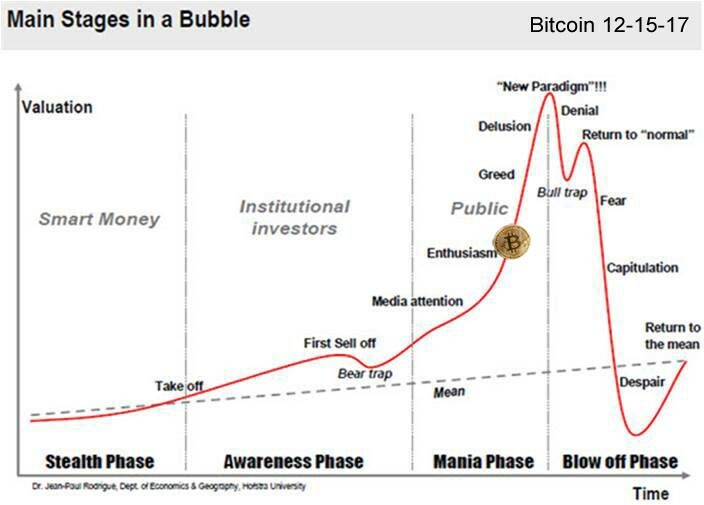 I think we are in the early enthusiasm phase of the bubble. Remember, gambling is fun and speculation is fun. Only bet what you can afford to lose.